There’s an old joke in cycling circles about someone seeing God riding a bicycle and saying, “Look! He thinks He’s Eddy Merckx.” If you’re going to talk about the greatest cyclists of all time, the conversation starts (and some say it can end) with the legendary Belgian rider. 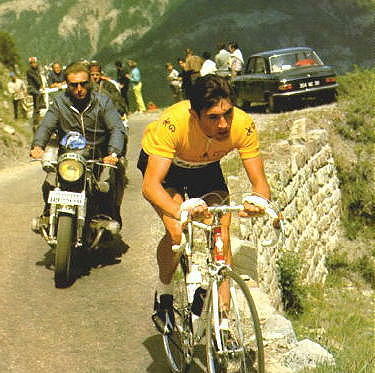 For the next several years, Merckx would establish himself as one of the most dominant riders in the sport’s history. He would win four consecutive Tours from 1969 to 1972 before getting a fifth win in 1974. He would add victories in the Giro in 1970 and from 1972 to 1974. (He was only the third man every to win the Giro-Tour double and he would do it three times.) He added a Vuelta title in 1973, becoming the first man ever to win the Giro-Vuelta double. He would add a second World Championship in 1971 and break the one hour record in 1972. In 1974, he became the first man ever to win cycling’s Triple Crown by winning the Giro, the Tour and the World Championship in the same season. Beyond that, his epic rides, in which he would ride away from the peloton and spend most of a stage alone, have become the stuff of legend. Merckx would be largely ineffective over his last few years, finally retiring in 1978. But the numbers for his career are impressive indeed. His five Tour victories, five wins in the Giro and three World Championships make him one of the most successful riders in the history of those races. He is one of only six men to win all three Grand Tours in his career. He is one of only two to win cycling’s Triple Crown. He has won more Tour stages (34) than anyone in history. He won nearly every one-day classic on the calendar, including the Tour of Flanders, Liege-Bastogne-Liege and Paris-Roubaix. An amazing career.